“In early October, Alex (Alex Christopher Williams) presented the “Decembrist” theme for the December exhibition at whitespace’s whitespec. This Decembrist world, circa the last month of 1825, became the springboard for much research and then the setting for “An Imagined Decembrist’s Carol” which took place around the mainhouse at whitespace. A former Russian revolutionary, a member of The Decembrist Uprising of 1825, is visited much like Dickens’ “Scrooge” by the spirits of past, present, and future. Through the windows, he views romanticized, and not so romantic, scenes from his life. 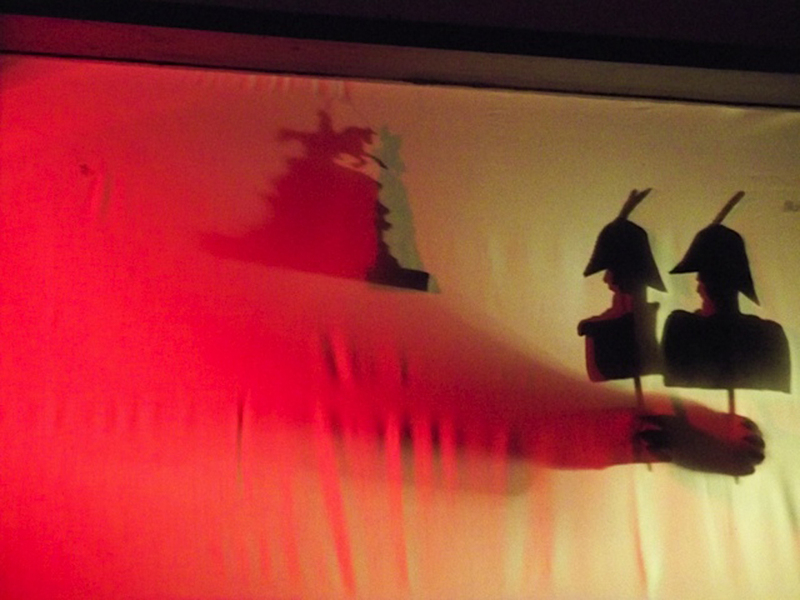 A shadow puppet show illustrated the events of the revolt, a ghost found its way back to a long abandoned bed, a violinist played Bartok, a lady weighed with an antique scale, objects were part of a seasonal narrative in miniature theater, a saxophonist played Yuri Shaporiin’s waltz, and two Russian sisters acted out Alexander Pushkin’s rousing poem, “To Chaadaev”. It was amazing to inhabit the house in period costume for the duration of the show. Within its windows, peering out, we really felt like ghosts..the costumes seemed to have appeared from the walls of the house itself and found their way onto our bodies! For a good while, we were truly in another space and time. Thanks again to Marymay Impastato, Denisse Alanis, Brian Bannon, Mary Barros, Mara Bennett, Xandra Brosius, Henry Detweiler, Debra Kahn, Anya Khalo, Luba Prakopchyk, Richard Sudden, & Maryn and Naomi Whitmore for all of their hard work and wonderful performances. This entry was posted in Uncategorized, whitespace and tagged alex christopher williams, art, atlanta art, december, decembrist revival, marymay ipastato, whitespace gallery on December 21, 2012 by Whitespace.